Members who like this album also like: To Pimp A Butterfly by Kendrick Lamar, A Moon Shaped Pool by Radiohead and Blonde by Frank Ocean. Related links: top tracks by Kids See Ghoststop tracks of the 2010s, top tracks of 2018. Showing latest 5 ratings for this album. | Show all 537 ratings for this album. Top Tracks: "Feel the Love", "4th Dimension", "Reborn"
Sounds like Kanye finally letting loose and just having fun with a release, no strings attached. Minor classic, consistent but too short to be considered as great as his other works. Kanye and Cudi are regulars of the unexpected and the surprise. With "Kids See Ghosts" Kanye West releases one of his best albums in terms of production and Cudi finally manages to release his perfect album. The atmosphere of the record is strange and psychedelic. The album is crossed by voices, malicious laughter, echoes, vaporous sample. Kid Cudi is really important on this album, for me, it's an album of Cudi and not Kanye West (Although we feel the presence of Mr. West in the prod.). "Kids See Ghosts" is a controlled chaos, a record of human tears, finished relationships and cut social ties. A record that is a new opportunity for Kanye to hit hard, especially at the production level with these songs changes of pace, trailing breakbeats and psyche samples. And when "Cudi Montage" and its loop drawn in an old piece of Nirvana ends we want only one thing: press repeat. Although it's being played this album is, for me, the best Cudi album and a very important album for alternative hip-hop.The only problem with the album is that it is too short. Best track: "Feel The Love"
It's not as innovative as other Kanye records, but the thing with Kids See Ghosts is that it takes the best out of the music today in order to create an "ultimate" 2018. It's just how I feel about it. The production is amazing and very interesting, Cudi's performance is great and Kanye is Kanye. 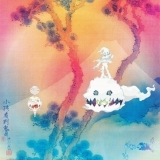 I wasn't really into Kanye till last year when I became a huge fan thanks to a friend and while I didn't know much about KSG before it came out I loved Ghost Town on ye so this album is pretty much everything I love, which makes it my favourite of 2018.